The ASEAN Wildlife Forensics Seminar brought together key ASEAN and international wildlife forensic experts, at the HQ of Thailand’s Department of National Parks, Bangkok. International speakers included ASEAN scientific experts, and experienced practitioners from the UK and USA. The seminar included over 170 attendees involved in policy making, enforcement, wildlife forensics and research. The ASEAN Wildlife Forensics Network was established during a 3 year project funded by the UK Darwin Initiative. The project is led by TRACE Wildlife Forensics Network, based in the UK. Key project partners are the ASEAN WEN, TRAFFIC Southeast Asia and enforcement agencies such as Thailand’s DNP and Malaysia’s Perhilitan (Department of Wildlife and National Parks). Starting in 2009, the project examined existing capacity and specific needs for identifying traded wildlife, before implementing a programme of training for enforcement and scientific officers, developing new forensic techniques and advising on laboratory processes. The Seminar represents the culmination of the current phase of the project. Due to continued need for further development of wildlife forensics capacity in the region, and ongoing support for TRACE involvement from the ASEAN-WEN, further funds will be sought to expand the capacity already developed in the first 3 years of the Network’s development. 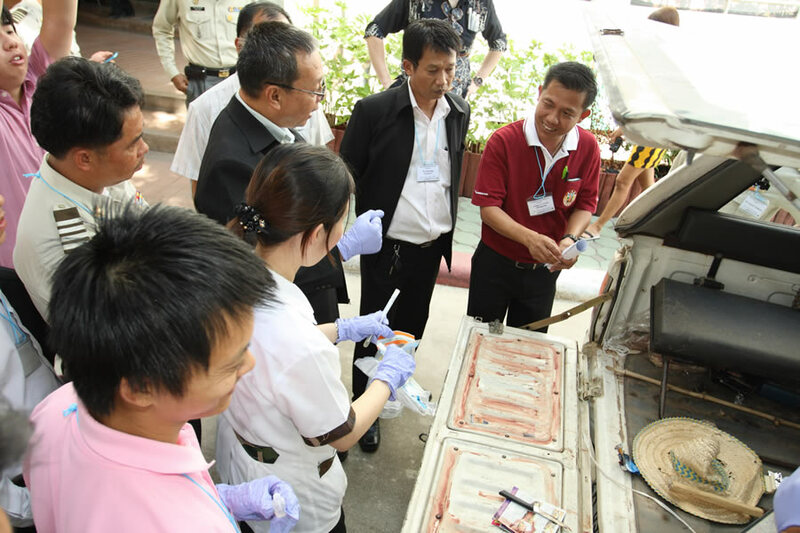 The photo below shows enforcement officers being trained in swabbing blood from a suspected poacher’s vehicle, in a mock scenario which ensured Thai investigators met with and interacted with the scientists who would ultimately process the samples the officers submitted in real life investigations.